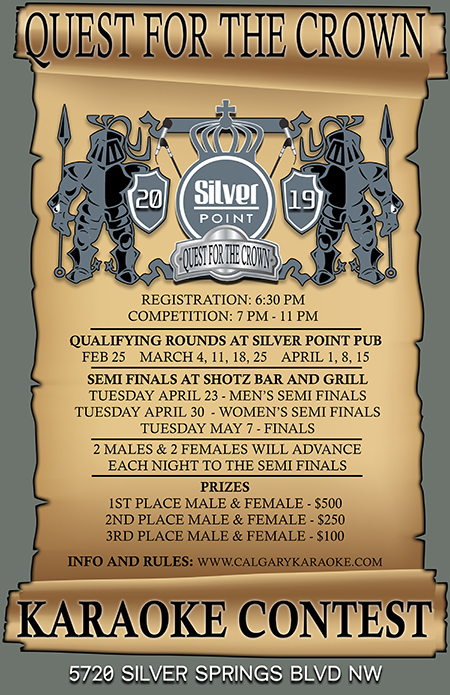 Every year we collaborate with Silver Point Pub and Shotz Bar and Grill to host the Quest for the Crown. This started in 2015 and has been an annual event each year since. Information regarding how the contest is scored, prizes, dates and more will be found on this page. We have posted the 2019 Quest for the Crown competitor information below including the breakdown of the scoring system used. Any person may enter the contest that belongs to an Organized Labor Union connected with the entertainment industry, as long as that person is not disqualified by rule number 2. Contestants MAY NOT utilize live props. This will include back-up singers, dancers or animals. Non-human props such as costumes and other accessories are permitted. Musical instruments may be used as props, but are not allowed as an accompaniment to the contestants’ performance. Any prop used by a contestant must be carried on stage or into the stage area by the contestant, and must be completed in one trip onto or into the stage area. Song time limit is 6 minutes. Songs going over the 6 minute limit will be cut off. Judges will be instructed not to deduct points due to a song being cut off. Contestants may sing the same song as another contestant. You cannot change your song once sign-ups are closed. Rap and swearing is allowed; however songs containing offensive lyrics will not be allowed. Contestants who, during their performance, use offensive lyrics or perform in an obscene manner will be disqualified. If you are unsure, please check with the host. Contestants, their family or associates are not allowed to have contact with a contest judge before or during the competition. Contact includes verbal conversations and handshakes. This rule applies only before and during the time the contestants are performing. It is not reasonable to expect contestants, their families or associates from having contact with a judge directly after all contestants have performed. Breaks for judges during a contest shall be considered the same as time during a contestant performance and judges are off limits for conversation or any other contact. Contestants, their family or associates who exhibit offensive behavior during any portion of the contest will disqualify that contestant from further competition. Offensive behavior includes poor sportsmanship, bad manners, and lack of decorum. If the contestant, their family or associates exhibit offensive behavior after the contestant has competed, and such behavior is in the host establishment, even after the winners are announced, that contestant’s score will be nullified. If the contestant whose score has been nullified is a winning contestant, the next contestant in scoring position for that particular category shall be the winner. If there is a tie for the next in line, the winner shall be decided by the toss of a coin. Decisions of the judges are final. No arguing with the judges is allowed. Any contestant, their family or associates who argue will a judge may be deemed to be using offensive behavior and the contestant may be disqualified from the competition. No employee or sub-contractor/host of KISS Productions, who host a regular show, may enter the competition. If you wish to know if we have specific songs in our library, you can ask the host or email us at kiss@calgarykaraoke.com. We will purchase songs upon request, providing they are legally available. Contestants must arrive and sign in with the host a minimum of fifteen (15) minutes prior to the scheduled start time. You can also view the rules as a PDF file by clicking here.